Are you starting to feel a little turkeyed out, but still have a big bird carcass taking up space in your fridge? If you're like me, you always feel slightly guilty if you don't make a soup when you roast a chicken or turkey. That said, after several days of leftovers, your tolerance for turkey may be waning. Might I suggest a Turkey Mulligatawny soup...? I'm not really sure how I got it into my mind that I was going to turn my turkey into Mulligatawny. I guess I came to the conclusion that I wasn't looking forward to a Turkey Noodle Soup as much as I thought and it was time to break some new leftovers ground. 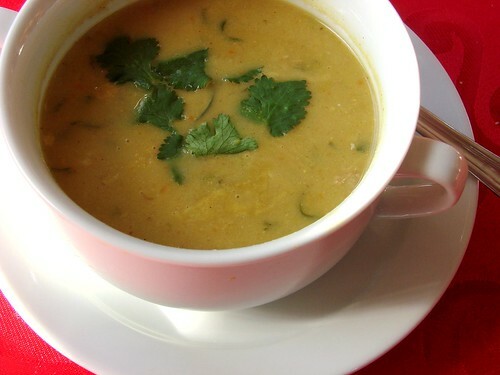 I've never made a Mulligatawny before, but I have enjoyed it at many of my favorite Indian restaurants. As I trolled the internet for Mulligatawny recipes I was surprised to discover that there were many different iterations of Mulligatawny. 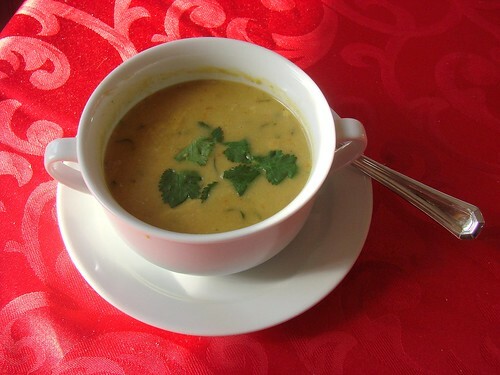 The dish is attributed to Anglo-Indian origins and the name "Mulligatawny" means "pepper water" in Tamil ("Millagu" மிளகு means pepper and "Thanni" தண்ணீர் means water). Some Mulligatawny recipes I found were made with lamb. Others chicken or vegetable based. Some had rice. Some had noodles. In a 7 quarts or larger stockpot saute carrots, celery and onion in olive oil until softened. Break turkey carcass into pieces so it fits into stockpot. Add water to the stockpot until so that the pot is about 2 inches from filled. Add salt and pepper. Simmer stock partially covered for 3 to 4 hours until the broth has reduced and it's a rich color and flavor. Remove from heat and strain broth into a large bowl. Remove turkey and bones from sieve. Sort out the edible bits of turkey and set aside. Press carrot, celery, and onion into the sieve so that the extra juice and some of the vegetables are extracted and added to the broth. Set aside. Heat butter and olive oil in stockpot over medium-high heat. Add the other onion, garlic, ginger, and jalapeno and cook, stirring, until softened and lightly brown. Lower the heat to medium, stir in the coriander, cumin, and turmeric. Saute vegetables with spices for about a minute then stir in the flour and cook for another minute. Add the broth (if your turkey didn't yield a full 10 cups, augment as necessary with canned chicken broth). Bring mixture to a boil, whisking constantly. Add the lentils to the thickened broth, turn the heat to low and simmer, covered for about 35 minutes. Add in apple and return to simmer for about 10 minutes more or until apple and lentils are tender. Remove from the heat and allow to cool slightly. Stir in the chopped cilantro. Ladle the mixture into a blender and puree in batches until smooth, or puree with an immersion blender. Return the puree to the pot and add turkey meat. Reheat over medium heat. Stir the coconut milk, lemon juice into soup. Season with salt, and pepper to taste Ladle soup into bowls, garnish with cilantro and serve with the lemon wedges.